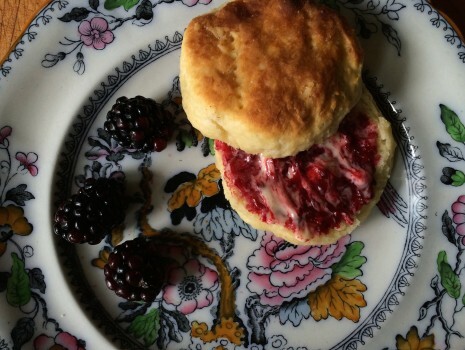 HOT BISCUITS & BLACKBERRY BUTTER | Jane Lear. Writing on Food and Travel. Compound butters—butter creamed with different flavorings—may be old-fashioned, but they are versatile as all get out—think of them as instant sauces that add finesse and another layer of flavor to very simple food. A classic French maître d’hôtel butter (softened butter mashed with chopped parsley and a little lemon juice and zest) ennobles just about anything, especially a grilled steak or steamed vegetables. Deep-flavored anchovy butter, with garlic and a couple of mashed anchovy fillets, adds resonance to fish, lamb chops, or broiled chicken. An herby-vervy butter, with chopped cilantro, parsley, and a pinch of cayenne or chile powder forestalls any “corn on the cob again?” ennui at the dinner table. Below is a compound butter that swings more sweet than savory. Its provenance was a happy accident: After we made a jumbleberry pie the other day, I realized we had a half pint of blackberries left over. Cooking brings out the soulfulness, the winey depth of blackberries, and first I’d thought to make a compote to spoon over pancakes or ice cream, or eat alongside a well-seared pork chop. But then I got to thinking about biscuits, hot biscuits, and well, that pushed me in a butter direction. Speaking of biscuits, I swear by Scott Peacock’s recipe. He’s a chef in constant pursuit of perfection, and so is constantly tweaking it; the version below is an annotated amalgam of that from the pages of Martha Stewart Living (April 2013) and the one that appeared in The Gift of Southern Cooking (Alfred A. Knopf, 2003), which he wrote with his longtime companion, Miss Edna Lewis, one of America’s most evocative chefs and food writers. Scott is no slouch himself. 1. Put the berries, sugar, and lemon juice in a small saucepan and bring to a boil. Reduce the heat and simmer, smashing most of the berries against the side of the pan to break them down, until the mixture is of a syrupy thickness and smells intoxicating. Remove the pan from the heat and let the mixture cool completely. 2. Put the butter in a bowl and mash with a fork until it’s light and creamy. Gently work the berry mixture into the butter, then pack it into a ramekin. Refrigerate for an hour or more to let it firm up and the flavors mingle. Serve with hot biscuits, pancakes, waffles, or toast. It would probably be good in oatmeal, too. 1. Preheat the oven to 500º with the rack in the upper third. Whisk together the flour, baking powder, and salt in a large bowl. Add the lard or butter, coating it well with flour. Working quickly, rub it between your fingertips until approximately half is finely blended and the other half remains in large flat pieces, about ½ inch in size. 3. Generously flour a work surface and immediately turn out the dough onto it. With floured hands briskly knead 8 to 10 times, until it becomes cohesive. Gently flatten the dough with your hands into a disk of even thickness. Using a floured rolling pin, roll it out to a thickness of ¾ inch. Flour the rolling pin as needed, but don’t flour the dough; otherwise, the tops of the finished biscuits will be dusty. In The Gift of Southern Cooking, Scott explains that, “Distressed by the chemical additives and aftertaste of commercial ‘double-acting’ powders, Miss Lewis years ago started making her own baking powder—a traditional mixture of cream of tarter and baking soda.” He started using her formula, and soon came to appreciate the difference. I’m a believer, too—there’s no metallic aftertaste like there is with powders that include aluminum sulfate. Sift the ingredients together 3 times and transfer to a clean, tight-sealing jar. Store at room temperature, away from sunlight, for up to 6 weeks. Posted: August 19th, 2014 under baking, people + places, recipes, summer. I’m fascinated with the idea of piercing the biscuit dough with a fork. I have never heard of doing that before. I might have to try it. Also, the blackberry butter looks divine!